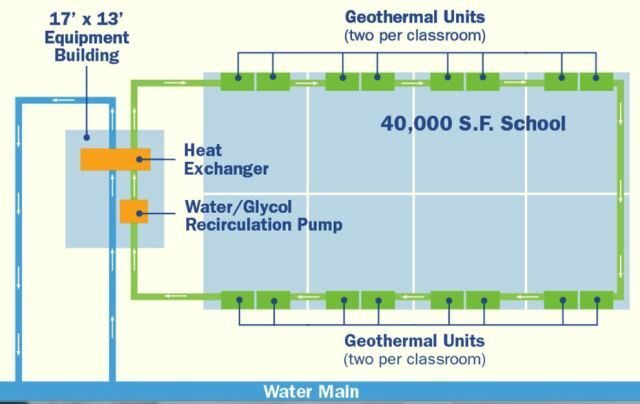 Geothermal heating and cooling (also known as a ground source heat pump) allows us to use the world’s largest thermal mass - the Earth itself - as a heat source in the winter and a heat sink in the summer. For a given amount of energy input, a ground source heat pump can deliver four to five times as much heat compared to a comparable natural gas furnace. And for cooling, it’s twice as efficient as a traditional air-conditioner. Although this is a very efficient method of heating and cooling a building, it’s also quite expensive to install, due to the cost of drilling and excavation. As a rule of thumb, ground source heat pumps are most cost-effective when used in light commercial buildings, schools, or other medium-sized structures. William L. Buck Elementary School in Valley Stream, NY has teamed up with American Water to pilot an innovative approach to geothermal heating and cooling: using the municipal water system in place of the network of underground pipes that normally carry the heat transfer fluid. This reduces the installation cost of the system by eliminating the most expensive part: drilling. I contacted William Varley, the vice president of American Water's northeast division, who gave me a run-down of the system. In heating mode, the municipal water main feeds ground-temperature water into a heat exchanger, where heat from the water is extracted and transferred to the water/glycol solution. The heated solution is pumped through the building, and delivered to its rooms. Each room has its own unit so rooms can be controlled individually. Educators know that physical comfort affects the learning environment, so not only does the system save money and reduce a school’s carbon footprint, it also helps to improve education - a triple win! Many schools don’t have air-conditioning since the schools have limited summer utilization. Nonetheless, there are times when the building is in use, and it’s rather uncomfortable on hot summer days. The beauty of a ground source heat pump is that it can work in reverse, where the water/glycol solution extracts heat from the rooms and transfers it to the municipal water through the heat exchanger. With the geothermal heating system in place, there’s no extra cost to have a cooling system. Overall, it’s a 133 ton heating/cooling system that pumps up to 250 gallons per minute through the heat exchanger. Worst case, that’s 360,000 gallons per day - less than 2% of the total water that runs through the water mains in that municipality - a proverbial drop in the bucket. The entire system cost was about $3.4M; with the lessons learned from the pilot, future systems should be around $2M. 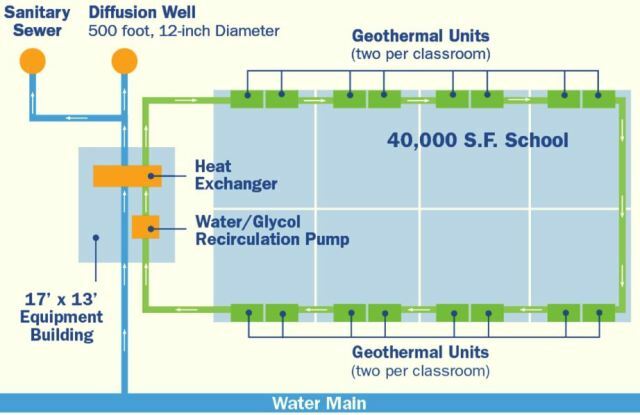 Preliminary data shows that the geothermal system has saved the school district more than $40,000 per year in heating costs, while increasing comfort in the summer by providing cooling. It’s probably not feasible to have every city home use municipal water for geothermal heating and cooling - the cumulative effect of all those houses changing the water temperature would most likely negate the benefits. However, I was wondering about rural homes with private wells. Would it be cost-effective to use well water in the same way that Buck Elementary School is using municipal water? It would depend on several factors, including the size of the aquifer, its depth, its average temperature, and the number of homes drawing from it. Any geothermal experts out there want to offer an opinion?